Turkey's children's crossings were a kind of their own without clear influence from other countries. Our small sample of rock-signs, to the contrary, illustrates clear similarities with designs from other countries. 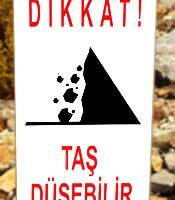 Our sign from the European part of Turkey comes close to the one we dug up in Murree (Pakistan). We see four bolders with strokes suggesting a fast fall. 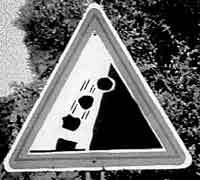 Turkey's way of doing is more realistic: the boulders aren't dot-like but have a real-world irregular shape. 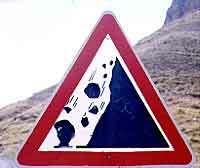 The ground rock is distorted by the impact forces. 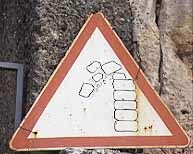 The warning sign from Cappadocia sticks to the velocity strokes but is clearly inspired by the standard from the United Kingdom: three pebbles on top, then a big boul­der, again three smaller rocks and one huge boulder to make the point clear. The artist took the liberty to mould the bot­tom boulder a bit into better blending into the land­scape. 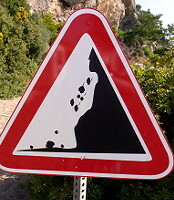 The text reads: Beware - rocks can fall (at least that's what S.V. told me). In all its simplicity most educating: bigger rocks eating smaller rocks. It's the same with fish. Reminds me of an early computer game as well. Pacman, wasn't it? We've found similar behaviour in Sri Lanka. We've seen the weirdest kinds of stones (see also Romania) but this is really something. We are looking at leaves of holly falling down like stones. And they come down fast. And when they finally reach the ground, they manage to keep upright. I tell you: no easy feat.